If anyone can give me some positive feedback on my concerns - I may get some bloody sleep at night!! Thanks all- from two worried little kidlets too!! Crikey. Forecasts this far out are not going to be very dependable. 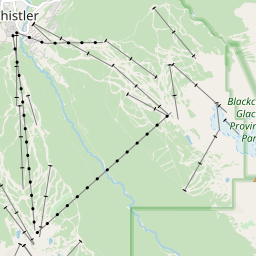 In the last 4 years, Whistler's first opening date was 17-23 November. Reality is that there is a difference between opening dates and having all runs available. As long as your expectations are aligned with that you will be fine. For the last 2 years I went there on the second week of December. Last year the snow was not that great but it was ok. The mountain was opened 95% if not more. In 2016 I had the chance to ski in 50" of fresh snow when I went there the same week of December. This year I am also booked Dec 8-15 and I hope won't have an issue. Accurate snow reports aren't usually available until a resort opens. We have gone to WB for the past 3 winter breaks, around Dec 20-30 each time. Snow conditions were fantastic first 2 years and decent/very good last year. But this year is a weak El Nino winter, and that sometimes means less than normal precip and above average temps in this area. So far, that is exactly what's happening. Tough to say if this pattern will "break" for at least a couple of weeks so cooler temps and more snow falls. However, by this time the past 3 years, right at about the time the resort was ready to open, the conditions were better then than they are now. The resort will be open in early Dec, but it may not be worth it since most runs would be closed and those open may not be that good. I guess we are lucky we have an extra 2 weeks before we arrive...more time for more snow hopefully! 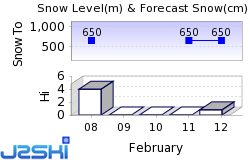 I reckon the snow gods are going to look favourably on us after all! Come on give us a meter over the next week please!!! I think the snow tides are turning...and fast! Looks like about a foot of snow fell on mid and upper WB today, and most forecasts are showing about 2-3 more feet of snow in the next 1-2 weeks. Got to get that snow line lower though, as base still not getting any snow. Its really an interesting fight between the current weak El Nino pattern that wants the WB area to be warmer with low snow vs the typical snow your brains out WB in late Nov and Dec...it appears the latter may finally be taking over for a while - which is great news!